Folk Music. In my earliest understanding of the term, it involved one man or woman, playing a guitar and singing. By that definition, Keegan McInroe is the closest I’ve come to presenting a folk singer. McInroe plays mostly acoustic guitar here. He plays occasional single note runs, but mostly he strums. McInroe does no solos, flashy or otherwise, but he is as fine a rhythm player as you would ever care to hear. For a couple of tunes, he puts down his acoustic, and plugs in his resonator guitar, but it’s still strictly rhythm. Can you think of anyone nowadays who does an entire album of just vocal and guitar? It’s so rare that we listeners have lost the patience for it. So McInroe needs to do something to vary the sound here. So one song might have a fiddle, another a harmonica, another a mandolin. Trumpet and jaw harp are more unusual choices that also turn up here. I would never have thought of it, but acoustic guitar and trumpet turns out to be a great combination. McInroe’s voice has a gruff quality. It sounds like he has done a lot of living. In his mellower songs, his voice can convey longing and desire, as well as sorrow. He can also go with a rougher sound for a great bluesy effect. When I listen to music for the first time, I hear the sound and feel of the music. I usually don’t know what the songs are about until later. When I receive an album for review, I give it that first listen, and I decide by the feel of it whether I want to come back to it. If I do, I find out then what the words are saying. And that happened here. So call it a coincidence if you like that I went back to review this when I did. 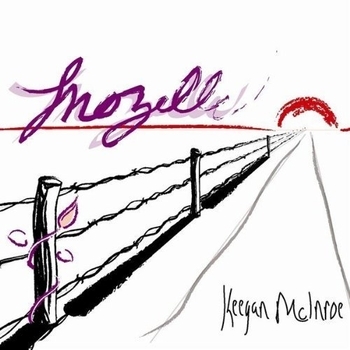 Mozelle was Keegan McInroe’s grandmother, and the album is dedicated to her memory. The title track leads off the album, and here McInroe’s grandfather describes his love for her, and his memories of their life together. This sounds like the words you might speak at a funeral, in honor of the newly departed. There would follow a hymn, talking about the promise of a bright hereafter, and on the album this is the traditional Sweet By and By. The rest of the songs on the album are originals. I can attest that the death of a loved one can make you look back at your life, and that it is what happens on the rest of the album. McInroe is a devout Christian, but he never gets preachy here. He describes a man torn between sin and salvation. Statements of faith interrupt sequences of songs about lost loves and earthly temptation. McInroe, as he presents himself here, is not a man who is better than us because he is saved. Rather, he is a believer who finds it hard to live up to his own beliefs. This makes him thoroughly human. Christ himself shows up in a couple of songs, and McInroe makes Him human as well. The Jesus song has Him stopping by for a visit. He and McInroe’s character share jokes and wine, and Jesus has a message for him. The message is a private matter, and its contents are not in the song, but they don’t need to be. This is a kind of Christianity I have never encountered before, and I find it very refreshing. The Jesus Song is followed by White Elephants. McInroe’s character falls asleep at the end of The Jesus Song, and it seems to me that White Elephants is the dream he has. The lyrics, about dancing and talking elephants, seem silly and slight at first. But this is the surreal language of dreams, and this dream has something real to say. Following the trials McInroe’s character has endured to this point, White Elephants is a song of encouragement. There are more trials to come, culminating with The Yank. This one strikes me as being Keegan’s effort to make sense of an incident he has heard about. The story, which I don’t want to give away, has elements of Greek tragedy. In trying to comprehend how this could happen, it seems to me that McInroe’s character experiences a bottom. This story brings to the fore all of the spiritual struggles he has been going through. The Yank is also astonishing musically. McInroe plays the rhythm, with a dialog between the fiddle and the trumpet on top. The turbulence of emotions is reflected in the interaction of the lead instruments. After The Yank, only two songs remain on the album. Waiting is a hesitant, and The Way is an assured, reaffirmation of faith. The Way is the most religious song here, a retelling of the Easter story. So Mozelle, taken as a whole, seems to me to be a tale of a man wrestling with his spiritual path. His road is not easy. I don’t think the matter is necessarily settled at album’s end. But this is not an album that requires you to share McInroe’s faith. I am not a Christian, but I am taken with McInroe’s honesty in the telling. And I can relate to the theme of struggling with one’s spiritual path. That can happen in any belief system. Even though McInroe supplies specifics, his theme is universal. And his telling is for everyone.